Chondroitin is a complex carbohydrate found in our connective tissues. In the cartilage that cushions the joints, it will draw fluid into the tissues; important as there is no blood supplied to cartilage. This fluid draws important nutrients to the area, making the cartilage spongier and more capable of absorbing shocks. Many researchers are convinced that chondroitin can strengthen the protein strands that make up connective tissue. Some evidence has shown that it can reduce inflammation and repair cartilage, especially if the tissue has not been totally damaged. Glucosamine is a natural substance created by the body and found in certain foods. It plays an important role in the production and health of cartilage, the soft rubber-like padding that cushions the ends of bones and prevents them from grinding painfully against each other as the joint moves. It also helps develop ligaments, tendons and nails. Usually our joints make sufficient glucosamine to keep the cartilage in good shape, but as we age, we lose some glucosamine and other substances. The cartilage can dry out, deteriorate, crack or become thin from wear. Left exposed, joints may become inflamed, stiff, swollen, tender and painful. Creatine Monohydrate is an amino acid compound that is stored in muscle tissue where it is used to create the energy required by muscles. It is essential to muscle contraction and helps in the muscle-building process. 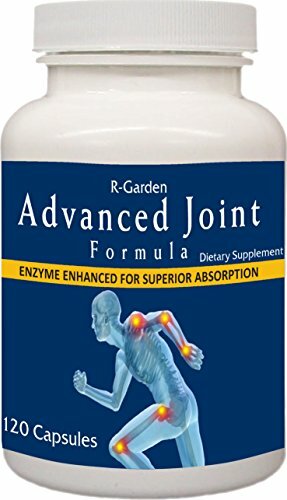 Advanced Joint Formula is a breakthrough, all-natural product designed to increase flexibility, strengthen joints and decrease inflammation. It contains: 1) A synergistic blend of 2 powerful "pain buster" ingredients - Chondroitin Sulfate and Glucosamine Sulfate, 2) Creatine Monohydrate, 3) Calcium Citrate and Magnesium for bone development and 4) Lipase and Amylase to enhance the delivery of the other ingredients and to help in inflammatory conditions. Chondroitin Sulfate is a powerful anti-inflammatory that seems to promote flexibility in tendons, ligaments, and cartilage. Glucosamine Sulfate appears to support the regeneration of cartilage and helps lubricate joint surfaces for easier movement. Creatine Monohydrate appears helpful for improving muscle strength and boosting energy. If you have any questions about this product by R-Garden, contact us by completing and submitting the form below. If you are looking for a specif part number, please include it with your message.